If you're after a camera bag from top brand Lowepro, Amazon has some unmissable Black Friday camera and accessory deals. The top deal is for the Lowepro Flipside 500 AW II Camera Backpack, which has had a whopping 43% slashed off the list price. That shaves nearly £73 off this excellent bag, making it a very attractive £94.73 (was £167.31). 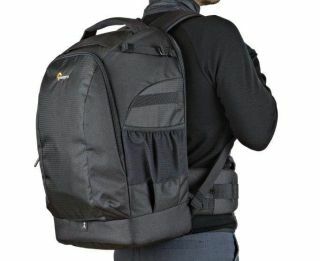 The Flipside 500 AW II is a high-capacity backpack, which adjusts to fit a wide range of gear and also boasts dedicated laptop storage space too. With all-weather AW cover providing protection from the elements, it's also a roomy backpack that'll comfortably hold all your gear in its 30 x 19 x 48 cm internal storage capacity. Amazon UK is also slashing 24% off the price of the ultra-flexible Lowepro Sac Revolver Top Loader Zoom 75 AW II Noir, which offers multiple different wearing options for extra tremendous freedom of movement. Save 24% - You can grab the Lowepro Sac Revolver Top Loader Zoom 75 AW II Noir for just £73.95 from Amazon UK right now while stocks last. You'll also get 30% off the Flipside Trek BP 350 AW Backpack in grey/dark green, meaning you can pick up this bag that's suitable for a DSLR plus lens for just £84.11 (was £119.95). Save 30% on the Flipside Trek right now at Amazon UK. Finally, the Lowepro Flipside 400 AW II Camera Backpack is also discounted by 25%, meaning that the 500 AW II's smaller brother is now just £82.92 (was £111.24).